Naseebah is a beautiful mare with fantastic movement. She is bred for a performance career; many full brothers and sisters of her dam, Dell Nameera, have excelled in endurance, and with her pedigree, Naseebah will both perform under saddle and breed on. She is a friendly mare, always first up to say hello in the paddock. She’s been shown, trucked, stabled, and covered. Naseebah is well behaved for the farrier, easy to handle, and a joy to have around. 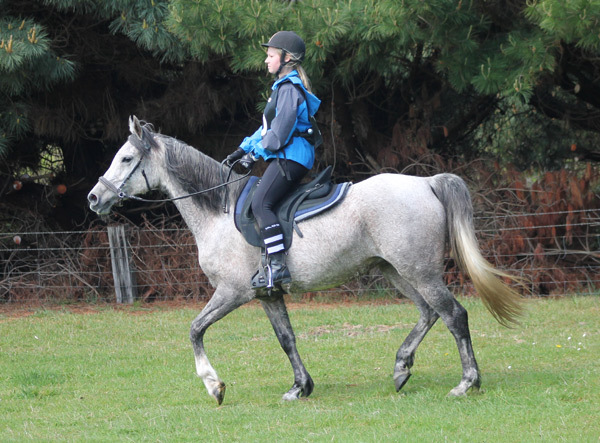 In November 2015 she was sold to Canterbury endurance rider and trainer Chris King, and is destined to become her “forever pony”. Naseebah is by our pure Crabbet stallion, Silver Omen, and out of Dell Nameera, one of several full siblings bred by the late Brian Ross. Many from this line have gone on to successful endurance and performance careers. Naseebah’s dam Dell Nameera by is Dellmount Sudani (Ralvon Pilgrim x Dellmount Shahzar [Iliad]) and out of Dellmount Nafisa (Ralvon Pilgrim x Libanah [Othello]). Naseebah is 95.3% Crabbet. Lyn washes Aurora Naseebah down. From left, Raffeah (Lyn), Naseebah (Kimberley) and Kassanova (Robin) coming in from the second loop at Sandy Point.